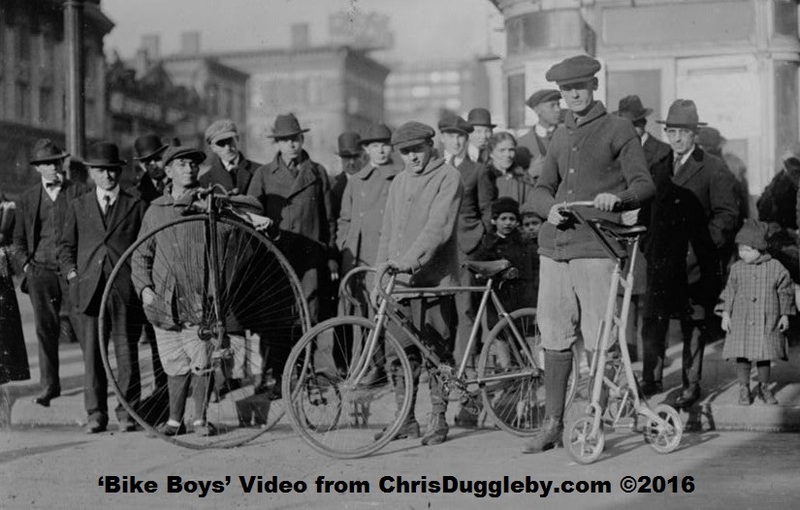 This week’s blog features century old photos of Bicycles, Penny Farthings and their riders. 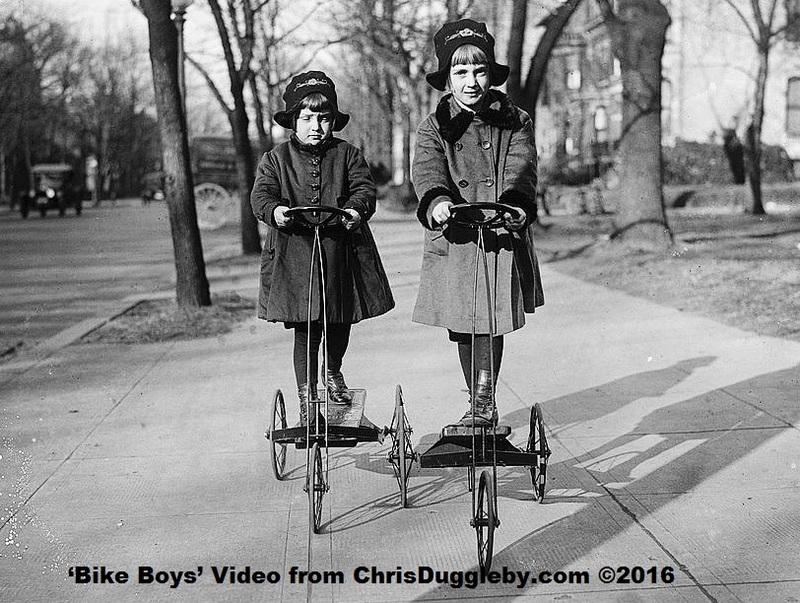 The vintage picture collection also includes US messenger boys from around 1910 who despite being children were expected to ride through areas frequented by prostitutes and gamblers. To add some much needed glamour to my website I have also included some beautiful young lady bikers (with even more in my new video Bike Boys). In this rapidly changing world where fashions and styles seem to change every month it is refreshing to think that one piece of equipment we see every day has hardly changed in appearance in over 100 years. In today’s report I would like to share with you some vintage pictures of bicycles and cyclists which could have been taken yesterday – until you look closer at the horse drawn carriages and old-timer cars in the background. It is not only the presence of some very old methods of transportation but also the fashions featured in the photos that help to transport you back to a long forgotten era of gentlemen wearing hats and ladies in flowing dresses (who of course also wore some very elegant hats). In fact I really had to search hard to find photos of bicycles with a shape which differed significantly from that of today. 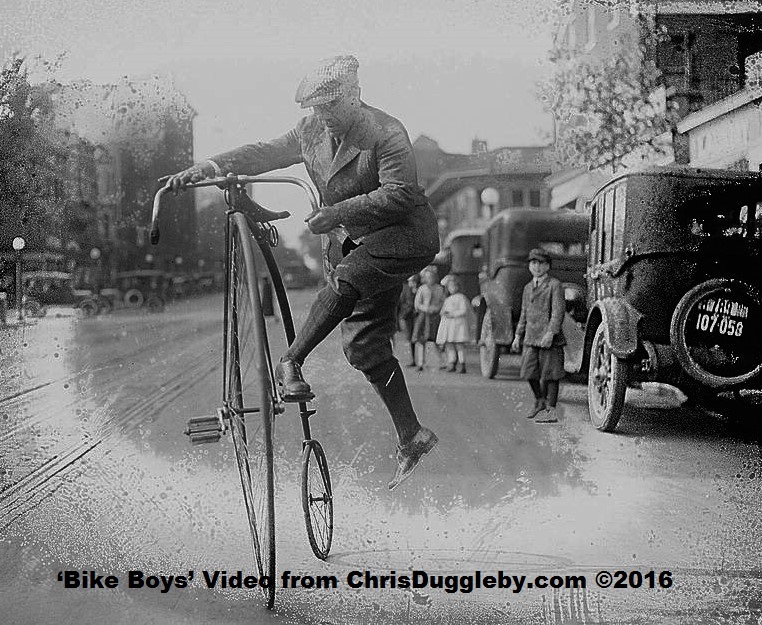 However, if you go back to early 1900 or even the late 1800’s it is possible to see examples of the old penny farthing bicycle. This was so named because the different size of its wheels reminded people of the penny and farthing coins which existed in the UK at that time. I was fortunate enough to find one very old photo of an elderly gentleman demonstrating the challenges in trying to mount this very challenging form of transportation. In the next couple of days I will add my old bicycle photos to the ‘Vintage Photos‘ galleries which is an area of the ChrisDuggleby.com website dedicated to some very old pictures I have restored. Because of their age I have had to do some restorative work on most of the old photos but I have endeavoured to maintain their original character and charm. I have already added a section to the Vintage Photos Galleries featuring several Child Labour pictures (again from around 1910). You may remember that in my last blog (link here) I presented a video ‘Ghost Children‘ on the theme of child labour which included a large selection of the ‘children at work‘ pictures. 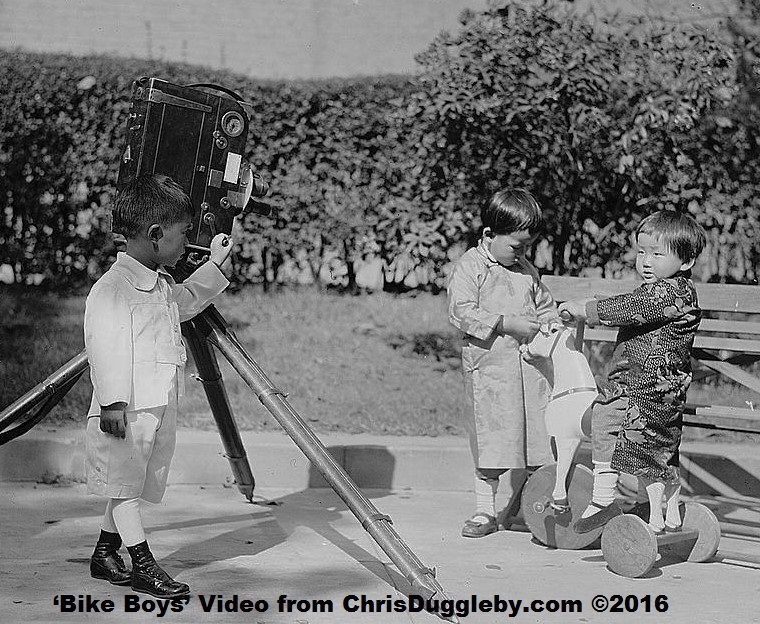 To link with the child labour theme of the earlier video I have also included some pictures of messenger boys in the Bike Boys video. I will add more of these pictures to the Vintage Photos gallery in the next couple of days. 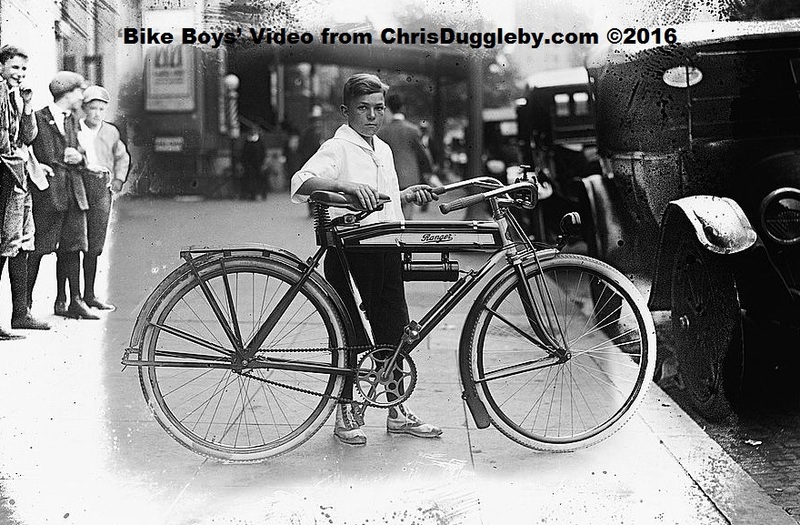 These are pictures taken between 1905 and 1915 of young boys who were used to deliver messages and parcels in the USA. Sometimes they where very young (10 years of age or less) and they were expected to ride to some very undesirable areas such as red light districts or gambling dens. Many of these pictures were taken by Lewis Wickes Hine (1874 – 1940) a pioneer in the use of the camera as an instrument of social change. Please visit the Vintage Photos pages and let me know if you have any suggestions for future themes. Meanwhile perhaps I can introduce the support team who were involved in preparing some of these vintage pictures. In this shot they are preparing a selfie with what I understand was an early Asian copy of a prototype iPhone. Enjoy! Could this be Samsung testing an early prototype of their answer to the iPhone? If you found this article interesting please consider taking a look at some of his other recent reports on similar subjects. I enjoy following your life in action. The Bike video was awesome. Got us to talking about our first bikes. Mine was a Schwinn and I was 12 when it became mine. Thanks Linda, I hope you will enjoy the vintage photo collection – more pics should be up in a couple of days. I remember your own website a few years back which featured several old photos which were really interesting. It is great how the camera can transport us back to a bygone era.